Niall Pearson a Corporate Broker at Hybridan chats with DirectorsTalk about the Biotech Sector. Niall provides some valuable insight into the Biotech Sector, explains the valuation gap and provides his thoughts on the sector outlook. Niall has an extensive network of small cap investors, covering a range of industries and geographies. Prior to joining the City with another city broker, Niall worked for an investor relations consultancy covering the resources sector where he worked with a number of AIM companies to help raise their profile amongst institutional and private client investors. Niall likes to relax in his native Suffolk either shooting, playing golf or watching rugby. As AIM brokers and advisers Hybridan are dedicated to fund raising, share price support and providing market-driven corporate finance advice. They raise capital for companies in the most efficient manner possible and communicate the investment cases of their clients to the market through equity research and investor road shows. Hybridan provide market-driven corporate finance advice to clients to help deliver shareholder value. 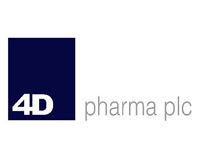 4d pharma plc LON:DDDD is a pharmaceutical company focussing on developing a number of projects targeting important new therapeutic areas. The company combines an understanding of, and access to solutions for, the technical, regulatory, clinical and financial challenges that are required to bring novel therapeutics to market. Click DDDD Hybridan for the full archive.